There is no way to write what I'm going to write in order to convey the excitement I'm feeling, the liberation that came to me over the past few days. These words that I'm staring at as I type look pathetic to communicate what I'm feeling. Please just know that I have seldom been so able to breathe as a result of hearing anything. If you've ever read my blog you'll quickly get a picture of a reasonably miserable woman, struggling in her own strength, trying to rely on Christ's power to live a better life. And writing again about how I've failed. I was living my life behind these constant prison bars of guilt. I was living as a Christian, but subjecting myself to the law. Every time I disappointed someone, or gossiped, or coveted, or was snippy (which is a nice way of saying I acted like the "b" word), I would put myself into this little cell, lock it through the bars and toss the keys outside and then cry, thinking how miserable it was to be locked up. 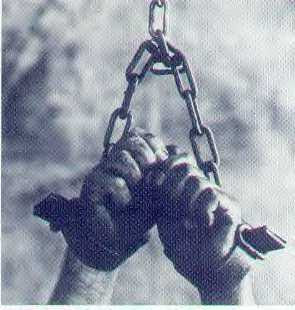 Lucky for me my Savior is the jailkeeper....and wants no one to be locked up. "No sin can be crucified either in heart or life, unless it first be pardoned in conscience, because there will be want of faith to receive the strength of Jesus, by whom alone it can be crucified. If it be not mortified in its guilt, it cannot be subdued in its power." William Romaine, one of the leaders of the eighteenth-century revival in England wrote this. It was revolutionary to me to think that every sin I commit in this life as a believer, because I have accepted the only remedy for sin (Christ), has no penalty with it. That kind of deflates it huh? I do not have to live with guilt anymore. For someone who continually feels guilty, this is pretty remarkable. Did you catch that? Never? Like never....ever....ever! I was living as someone who was condemned and I was trying to allow fear, of disappointing God, of impending doom, of a death sentence when I get to heaven, to motivate me to be a better person. fear is not a motivator for change. Condmenation is not a motivator for change. What is a motivator? Love. Freedom. Namely, the gospel. Christ's love is the motivator. And we find that "I love you" in the gospel. Listen to this quote from Horatius Bonar, a 19th-century scottish pastor. "Terror accomplishes no real obedience. Suspense brings forth no fruit unto holiness. No gloomy uncertainty as to God's favour can subdue one lust, or correct our crookedness of will. But the free pardon of the cross uproots sin, and withers all its branches. Only the certainty of love, forgiving love, can do this...."
"That is why we need to "preach the gospel to ourselves every day." It is in the gospel that we find those unsearchable riches of Christ that produce not only justification but also sanctification." And there I will rest. * Most of this blog was taken from the book "The Gospel for Real Life", by Jerry Bridges. A book I highly recommend, which has pointed me to verses in God's word that have revolutionized my view of the gospel and my salvation.